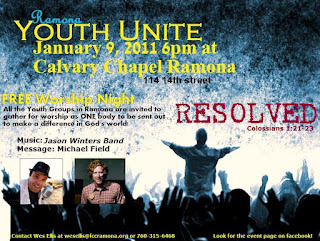 On Sunday night, that's the 9th of January, we had our second Youth Unite event in Ramona. We started doing these in August of last year and it's the result of about two years of networking between different churches in town and building trust between youth ministries through NNYM. It really feels like a culminating event, and what an amazing culmination it has been. Among as many churches as we can, the core of the youth ministry network in Ramona, we pool our talents and passions and open a collaborative night of worship for all the youth groups in town to gather together, to worship, to be challenged, and to be sent out as the Body of Christ to our schools, our families, and our whole community. We each take some part in the worship and we connect our worship and learning with some practical action by promoting some "para-church" organizations in which the students can get involved (including FCA clubs, Younglife, and The Planet Wisdom Conference). It's amazing what can happen when you take that "Body of Christ" stuff seriously! Jason Winters, who happens to be a local Youth Pastor, lead us in worship and we had the blessing of having Michael Field from Forest Home (a friend of mine, not to drop and names) as our guest speaker. Michael talked about "participating" with God in God's work in the world and that has to do with seeing past the distractions of our "very distracted lives" and having eyes that can see God in the people and in the relationships all around us. It was exactly what our students needed to hear! I wish that every community had something like a Youth Unite--some kind of practical opportunity for students and for the community to see and be a part of the Church with a capital "C"--something beyond theological jibber-jabber.